The small town of Lone Pine, California finds itself in a very blessed location. Not only is scenic Death Valley just an hour’s drive to the east, the beautiful Alabama Hills and dozens of mountain peaks are just to the west. And if you decided to drive north for a while, you’d reach Yosemite’s backdoor. All of these nearby attractions make Lone Pine a nice stopping place. Lone Pine is located along US 395 on the east side of the Sierra Nevada, near Mount Whitney. It’s at the junction of California Route 136, which leads to Death Valley. My day in Lone Pine started well before sunrise. I got up early and drove out to the Alabama Hills. While I was hoping for a photogenic sunrise, all I got was clouds. But, the early departure from my hotel allowed me to return and hit up the breakfast bar for a second serving of all-you-can-eat bacon. In other words, it was a good day. After loading up on protein, and before I headed east into Death Valley, I spent a few minutes looking around town. 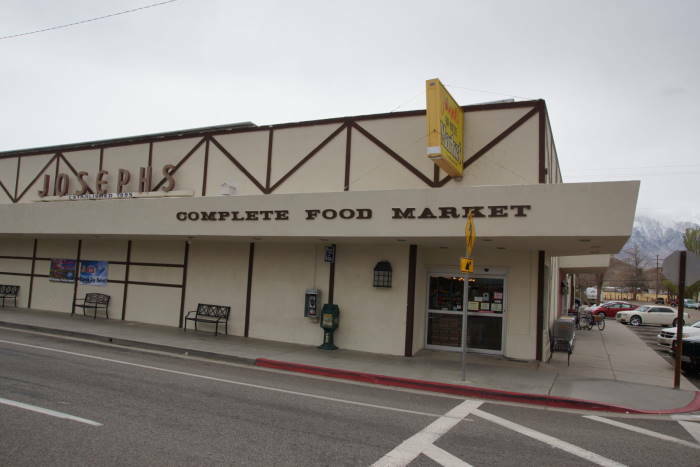 Lone Pine’s downtown district stretches for just a few blocks. There are several good places to stay here, with moderate prices (including the Dow Villa, pictured on the left — I didn’t stay there this time, but I have in the past). No matter where you are in town, you have a nice view of the mountains. Mount Whitney is among these peaks. It’s the highest point in the lower 48 states. And just think, the lowest point in North America is just a couple of hours away. You’ll also notice the smaller, more rounded hills in between town and the Sierra Nevada. Those are the Alabama Hills, and I’ll give you a closer look at them on a separate page. As for the town itself, it has a tiny locally-owned grocery store. Be sure to go inside and check it out. 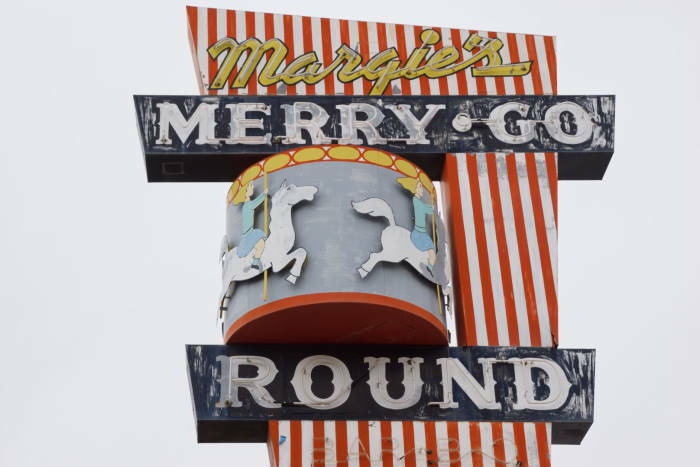 If you grew up in a small town, this will feel like you’re stepping back in time. 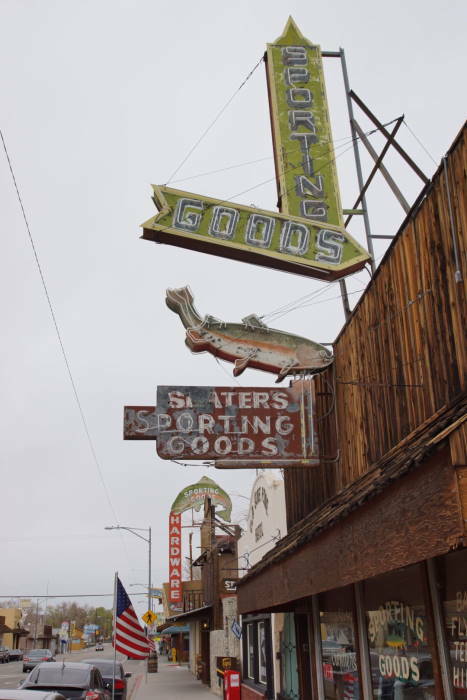 … as well as some other great signage along the main street, US 395. Lone Pine makes a great one-night stop on your way to Death Valley. You could also add a second day, if you’d like to spend some time exploring the Alabama Hills.